The postings below are the messages sent to our class during 2017. Click here to see the 2018 messages. Click here to see the 2016 messages. With sadness I must report to our class the passing of Teacher and Coach Dale Hittman. He died Saturday morning after a 2-year battle with cancer at age 71. The funeral service will be held on Dec 9th at the Pagenkopf Funeral Home in Oconomowoc. Visitation will be held from 2-3:30 with the ceremony at 3:30. As usual, our thoughts are with his family. But we realize not everyone can make that date. There is no reason why we can't do more than one day if there's enough interest. Summerfest goes on for 10 days, but the two weekends are probably preferable. To help, here are some of the performers that are probably of interest to us and the dates they're playing. If there is enough interest in doing another day and we can get someone to host, I'll publish it on the website and send out an email blast to the group with details. Drop me an email if you'd be interested and what dates you'd like. Debbie and I plan on going at least twice with one of those days being 7/6 because we want to see REO Speedwagon. If you happen to go that day, you are welcome to call or text myself or Debbie if you'd like to meet. It is with sadness that I have to report that our classmate, Jeff Pennow passed away on Thursday, March 23 at age 59. Our thoughts and prayers go to Jeff's family. His service is on March 29th from 10:30-11:00 AM. With sadness I must report to our class the passing of our Teacher & Coach John Richmond. He died on March 13th of heart failure at age 90. Services for Richmond will be on Monday, March 20th at Becker-Ritter Funeral Home in Brookfield (Lilly & North Ave). Visitation will be 4-6pm with a service at 6pm followed by refreshments. Many will remember John Richmond as a history teacher with the deep voice. He graduated from Pewaukee High School in 1944 and went on to attend UW Madison in 1944-45 and then Milwaukee State Teachers College in 1947-48. He received a BA with a major in history from Carroll College in 1951. He got his MS in Physical Education / Education from UW-Madison in 1953. He came to Tosa East in 1969 and retired from teaching in 1991. But for anyone of us who had the privilege of being on the football or track teams, Richmond will be remembered as Coach. 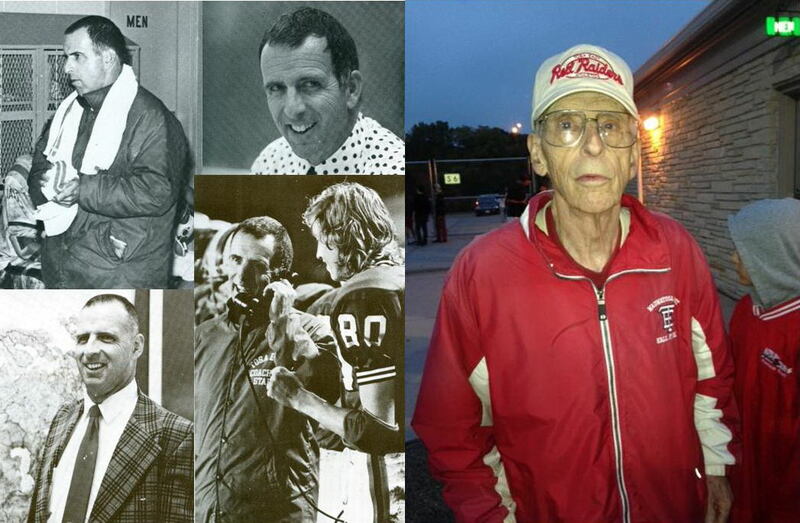 When he came to East in 1969 he became the football Head Coach and the following year the Head Track Coach until 1972. That was his most successful year winning East's first football title since 1939 and winning the State Class A Track & Field Championship as well as sweeping conference relays, conference outdoor, regional and sectional meets. After that year he was an assistant Track Coach, in charge of the sprinters. Though he retired from teaching in '91, he continued to coach until '95. He was inducted into the Wisconsin Football Coaches Association Hall of Fame in 1996. 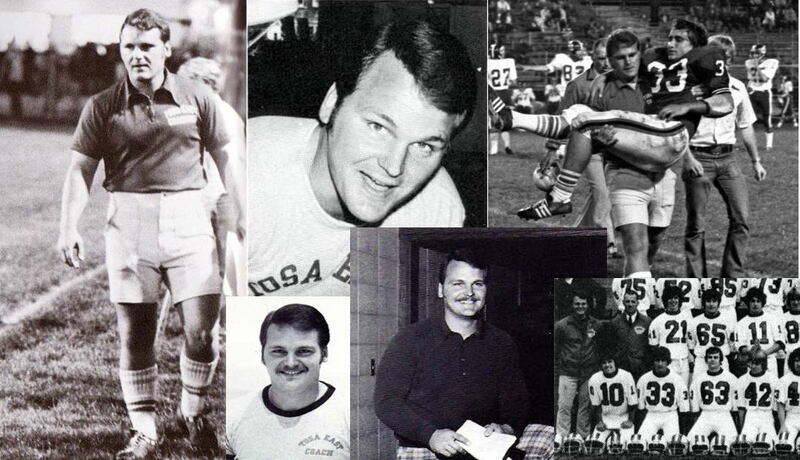 Speaking from a personal viewpoint, the Green Bay Packers had Vince Lombardi and Tosa East had John Richmond. He was in command of everything and you didn't wonder if he cared for the players, you absolutely knew it. 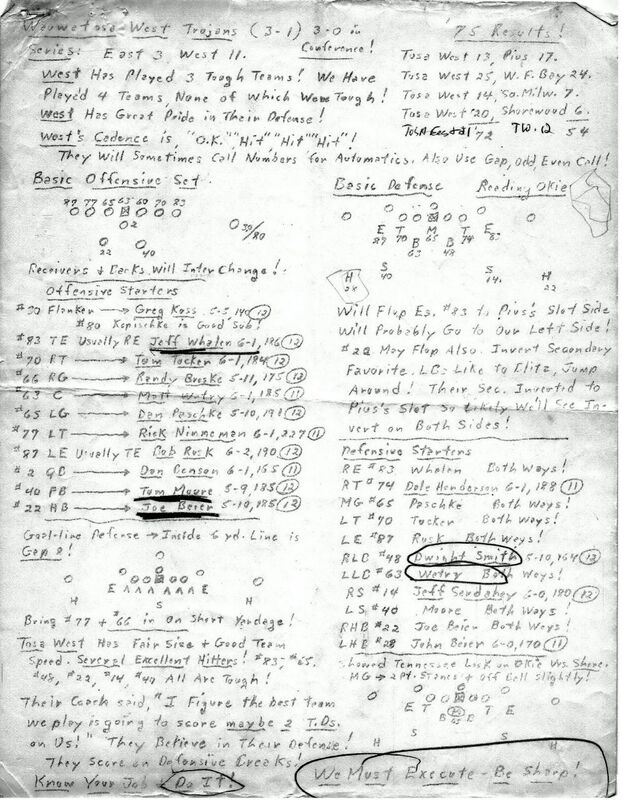 For every game he prepared an incredibly detailed scouting report. 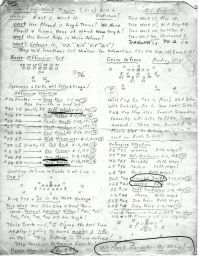 These were more detailed than most college scouting reports. They were anywhere from 6 to 8 pages! Without even looking at a single detail, I was always in owe of the effort he put into them. But it wasn't the least bit surprising because it was obvious he put in that kind of effort in every aspect of coaching. Richmond was known for his many sayings which were known as Richmondisms. In track where almost all coaches would hold out the watch and yell out splits as the kids run by the finish line - "59! 60! 61! 62! 63! C'mon! 66! 67! Not Richmond. He'd stand there and yell out splits as only he could. "MONDAY! TUESDAY! WEDNESDAY!!" In football it was always, "Get the lead out!" And it is seared in my memory how every football practice started by running a few laps when Richmond would yell, "Take off, you turkeys!" 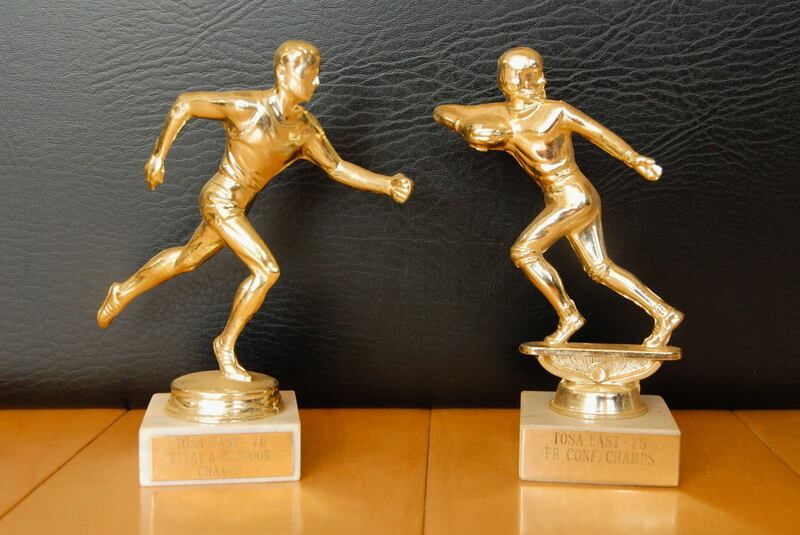 For our senior year, we shared the '75 Football Suburban Conference title and in track won both the Suburban Conference Relay and Outdoor titles. One final memory I'd like to share is about a football game in 1974, our Junior year. It was that year that they modified the schedule to include one non-conference game. It was the very last game of the year on a bright sunny Saturday against New Berlin Eisenhower on their field. I remember getting on the field before the game and looking over at our unknown opponents and it didn't look good. Their players were huge and, frankly, looked like we were playing a college team! Later Coach Richmond admitted to us that his first reaction was one of horror. "What have I done? What was I thinking scheduling this game? We're going to get slaughtered!" I can only wonder what the Eisenhower players were thinking looking over at the puny likes of our Tosa East football players. It was only a few plays into the game when we learned the Eisenhower coaching strategy was simply to find the largest players possible. They were so slow! After racking up a few touchdowns against them I actually started to feel sorry for them. They had to wonder, "What is happening?" We went on to win that game 35-0. Forward to about 3 years ago when I met up with Coach Richmond at Grace Morgan's memorial service when I got to ask him for his memory of that game. Without missing a beat, he starts. "The first play was a handoff to Tom Harwood up the middle and he gets stuffed (i.e., no gain). The next play Joe Zuba tries for a pass up the middle and it got swatted down. On third down he rolls right and decides to run rather than throw. He then proceeds to run into the end zone leaving a comical trail of fallen bodies behind him." Here he was at age 87 and could still remember it in detail! RIP, Coach Richmond. You will never be forgotten! Tosa East Players - Encore! Encore! The Tosa East Players are putting on a show next month in the beautifully (and newly) remodeled Tosa East Theatre which is officially called the Dale K. Hidde Theatre. The show, "Encore! Encore!" is an original musical comprised of show-stopping selections from the past 77 years of Tosa East theater in honor of our newly renovated theatre and the great number of students and staff who have contributed to this wonderful program. East Players has been reaching out to its alumni via social media. Everyone is welcome, friends, non-theatrical Tosa East alums--Tosa West Alums--neighbors--everyone! As in our day, the East Players continue a proud tradition of superior productions. The dates are: March 24, 25, 31 and April 1 at 7:30pm, and March 26 and April 2 at 2pm. But two of the dates are special and they are on the two Saturdays, March 25th and April 1st. There will be an alumni reception both Saturdays at 6:30--cake and punch in the Learning Center along with a tour of the new theatre. 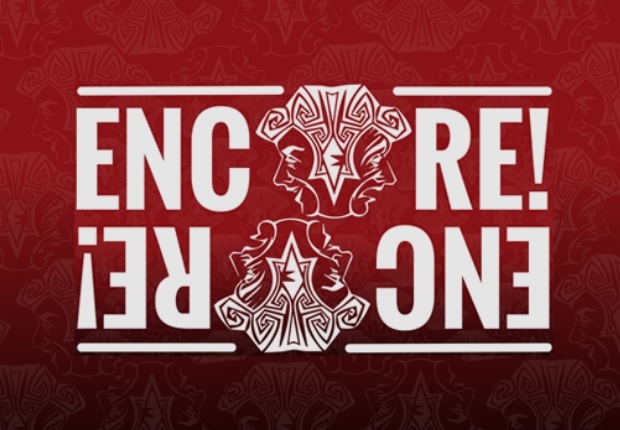 Press the Encore! Encore! icon to select seats and buy tickets. The alumni reception is free of charge. Mr. Hidde was an instructor at Tosa East from 1966 until his retirement in 1997. He graduated from East in 1958, at that time still just Wauwatosa High. He went to UW and got an MA in Theatre and got a degree in Music Education from UWM. 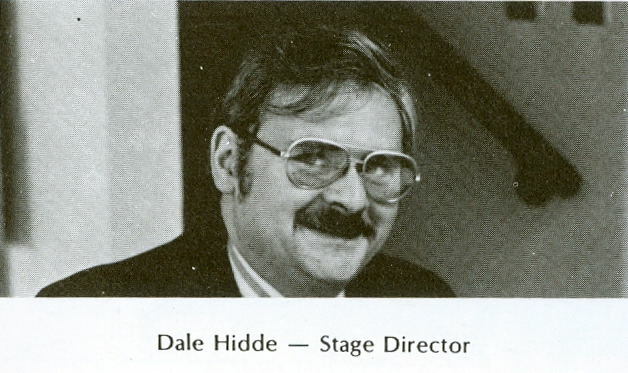 Upon his retirement in June of 1997, the theatre was officially named the "Dale K. Hidde Theatre" to honor his years of service. Today, Dale Hidde still lives in Wauwatosa and is on Facebook. 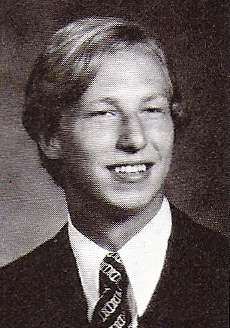 Currently, he is the only faculty member who is on our private Facebook group, Wauwatosa East Class of '76 Reunion. Unfortunately, we were unable to see the theatre during our recent 40th reunion Tosa East tour because they hadn't quite finished the renovation. The photos here I took at the tour during our 30th reunion. 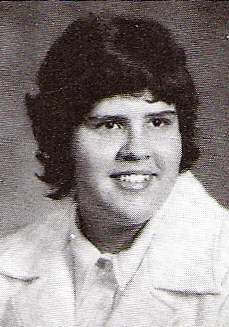 It is with sadness that I have to report that our classmate, Mary Polacek passed away on February 18th at age 58. Visitation will be held at the Becker Ritter Funeral Home on Friday, February 24 from 4 to 7 PM. A 10 AM service will be held at the Funeral Home on Saturday, February 25. Interment to follow at 4 PM at East Cemetery, Westfield, WI. Our thoughts and prayers go to Mary's family. 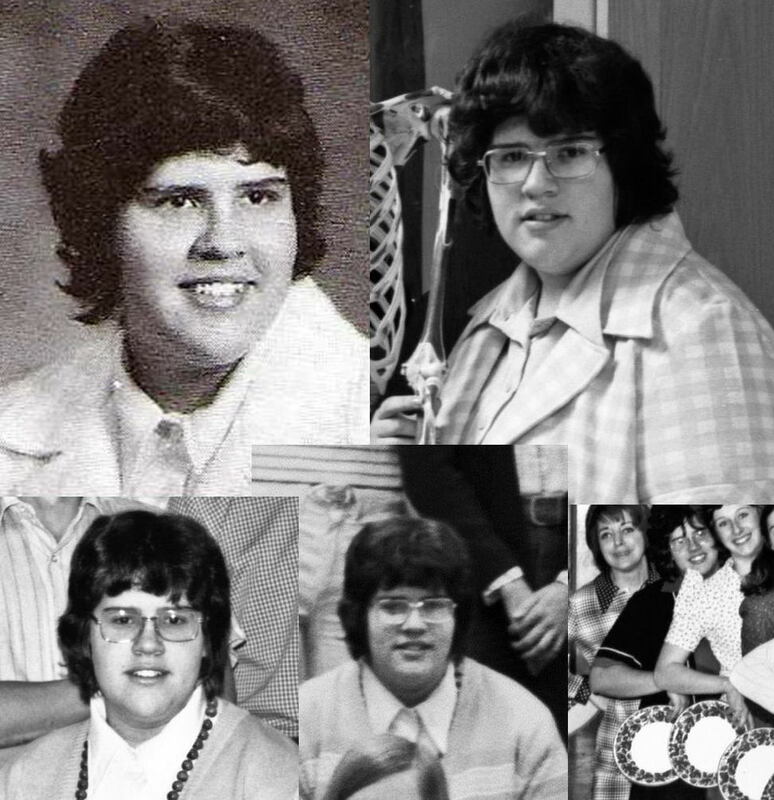 Here is a collage of pictures of Mary from our senior yearbook. All but the graduation picture were taken by Cardinal Pennant photographer Dave Bugni which he provided to me so they could all be placed on our class website. First of all, a reminder that I'm still looking for questionnaires. Though many have not filled one out, a large number of our group are exempt because you provided the information in the 40th reunion questionnaire. Please keep in mind this particular questionnaire is internal only. It will not be shared with anyone outside of the reunion committee and will not be anywhere on the website. There are a number of updates and they're all in the Photo Galleries section. The new sections are the school dances (Prom, Homecoming, and Turnabout), student pictures, and Tosa memories. I wish there were many more pictures, but for that I'll need contributions. If you have anything you'd like to share, you can email them to me (genohanson@aol.com) or you can mail them to me and I'll scan them and mail them back. If you wish to use the regular mail, send me an email first and I'll give you further instructions. We also have new pictures in the other sections as well. I was informed by two classmates that my last email landed in their spam folder. What they had in common was they were gmail accounts, so maybe it's confined to Google accounts only. I find this amazing because I'm using a Google Group to distribute these emails. But I'm fairly certain the reason was two-fold: 1) I often include links in these messages to the website. This is done as a convenience so you can simply click to go to the page. 2) I included an attachment (which by itself can be a trigger) and the PDF was a fillable form. Please let me know if any of my messages wind up in your spam folder. I need to track this to know whether the problem is getting worse and if I eventually have to leave out the links and/or attachments. Also, my real fear is there's the possibility that emails might be completely blocked (not even delivered to a spam folder.) I have experienced that with gmail myself.